Faber at Fight Night Round IV in Bellingham, Washington in 2009. Urijah Christopher Faber  (born May 14, 1979) is a retired American mixed martial artist and actor who fought as a bantamweight and featherweight in the Ultimate Fighting Championship. Faber won the WEC Featherweight Championship at WEC 19 on March 17, 2006, and held the title for over two years until losing it to Mike Brown at WEC 36 on November 5, 2008. Faber is widely regarded as one of the sport's pioneers for establishing legitimacy to lighter weight classes in MMA. After retirement on July 6, 2017 Faber was inducted into the UFC Hall of Fame as a part of the Modern-era wing. The Ultimate Fighting Championship (UFC) is an American mixed martial arts promotion company based in Las Vegas, Nevada, that is owned and operated by parent company William Morris Endeavor. It is the largest MMA promotion company in the world and features the highest-level fighters on the roster. The UFC produces events worldwide that showcase twelve weight divisions and abide by the Unified Rules of Mixed Martial Arts. As of 2018, the UFC has held over 400 events. Dana White serves as the president of the UFC. White has held that position since 2001; while under his stewardship, the UFC has grown into a globally popular multi-billion-dollar enterprise. Wrestling is a combat sport involving grappling-type techniques such as clinch fighting, throws and takedowns, joint locks, pins and other grappling holds. The sport can either be theatrical for entertainment, or genuinely competitive. A wrestling bout is a physical competition, between two competitors or sparring partners, who attempt to gain and maintain a superior position. There are a wide range of styles with varying rules with both traditional historic and modern styles. Wrestling techniques have been incorporated into other martial arts as well as military hand-to-hand combat systems. Brazilian jiu-jitsu is a martial art and combat sport system that focuses on grappling with particular emphasis on ground fighting. Brazilian Jiu-Jitsu was developed from Kodokan judo ground fighting (newaza) fundamentals that were taught by a number of Japanese individuals including Takeo Yano, Mitsuyo Maeda, Soshihiro Satake, and Isao Okano. Brazilian Jiu-Jitsu eventually came to be its own defined combat sport through the innovations, practices, and adaptation of judo. Faber was born on May 14, 1979, in Isla Vista, California, to Theo and Suzanne Faber. He is of Dutch descent on his father's side, and Italian, English, and Irish  on his mother's side. He went to Glen Edwards Middle School, Casa Roble High School  and Lincoln High School (Lincoln, California). He has two siblings, an older brother named Ryan and a younger sister named Michaella Tastad. Faber graduated from the University of California at Davis with a bachelor's degree in Human Development. While at UC-Davis, Faber was a two time NCAA national qualifier, qualifying for the NCAA tournament in 2001 and 2002. Isla Vista is an unincorporated community and census-designated place (CDP) in Santa Barbara County, California in the United States. As of the 2010 census, the CDP had a population of 23,096. The majority of residents are college students at nearby University of California, Santa Barbara or at Santa Barbara City College. The beachside community lies on a flat plateau about 30 feet (9 m) in elevation, separated from the beach by a bluff. Dutch people or the Dutch are a Germanic ethnic group native to the Netherlands. They share a common culture and speak the Dutch language. Dutch people and their descendants are found in migrant communities worldwide, notably in Aruba, Suriname, Guyana, Curaçao, Argentina, Brazil, Canada, Australia, South Africa, New Zealand, and the United States. The Low Countries were situated around the border of France and the Holy Roman Empire, forming a part of their respective peripheries, and the various territories of which they consisted had become virtually autonomous by the 13th century. Under the Habsburgs, the Netherlands were organised into a single administrative unit, and in the 16th and 17th centuries the Northern Netherlands gained independence from Spain as the Dutch Republic. The high degree of urbanization characteristic of Dutch society was attained at a relatively early date. During the Republic the first series of large-scale Dutch migrations outside of Europe took place. The Italians are a Romance ethnic group and nation native to the Italian peninsula and its neighbouring territories. Most Italians share a common culture, history, ancestry or language. Legally, all Italian nationals are citizens of the Italian Republic, regardless of ancestry or nation of residence and may be distinguished from people of Italian descent without Italian citizenship and from ethnic Italians living in territories adjacent to the Italian Peninsula without Italian citizenship. The majority of Italian nationals are speakers of Italian, or a regional variety thereof. However, many of them also speak another regional or minority language native to Italy; although there is disagreement on the total number, according to UNESCO there are approximately 30 languages native to Italy. Faber made his professional MMA debut as part of the Gladiator Challenge promotion on November 12, 2003, defeating Poes Manne by a guillotine choke at 1:22 of round 1. Faber then defeated George Adkins by TKO (strikes) on February 12, 2004, earning a shot at GC Bantamweight champion, David Velasquez. On June 6, 2004, Faber defeated Velasquez by unanimous decision, becoming the new GC Bantamweight champion. In his first title defense, Faber defeated Del Hawkins by TKO(strikes) at 3:19 of the first round on August 19, 2004. After this fight, Faber began to take fights in both GC and King of the Cage, GC's parent promotion. The guillotine choke, also known as Mae Hadaka Jime in judo, is a chokehold in martial arts and wrestling applied from in front of the opponent. The choke involves using the arms to encircle the opponent's neck in a fashion similar to a guillotine. King of the Cage (KOTC), also known as KmK, is a mixed martial arts (MMA) promotion based in Southern California, United States. Upon moving to KOTC, Faber defeated Rami Boukai by majority decision on September 24, 2004, barely a month after his last fight. On November 14, 2004, Faber defeated Eben Kaneshiro by submission (strikes) to win the King of the Cage Bantamweight Championship, co-holding it with the GC Bantamweight title. On March 13, 2005, Faber made his return to GC, defeating David Granados by rear naked choke at 2:13 of round 1. On May 7, 2005, he defended his KOTC belt for the first time, defeating Hiroyuki Abe by TKO (cut) at 2:37 of the third round. Returning to GC on September 10, 2005, Faber had his first defeat, losing the GC Bantamweight championship to Tyson Griffin by TKO (strikes) at :05 seconds of round 3. The rear naked choke (RNC) is a chokehold in martial arts applied from an opponent's back. The word "naked" in this context suggests that, unlike other strangulation techniques found in Jujutsu/Judo, this hold does not require the use of a keikogi ("gi") or training uniform. Tyson Lee Griffin is a retired American mixed martial artist who competed in the lightweight division. He competed for the UFC, Strikeforce, the RFA, and the World Series of Fighting. On October 29, 2005, Faber defended his KOTC title again, defeating Shawn Bias by guillotine choke at 1:24 of the first round. He returned to GC on December 11, 2005, defeating Charles Bennett by rear naked choke at 4:38 of round 1. Faber then fought at a TKO Major League MMA event on January 8, 2006, facing Ivan Menjivar. Faber won by disqualification at 2:02 of the second round when Menjivar landed an illegal kick to a downed Faber. On March 17, 2006, Faber competed for the first time in the World Extreme Cagefighting promotion, beating Cole Escovedo by second round doctors stoppage and winning the WEC Featherweight Championship. On May 13, 2006, he fought for the King of the Cage Bantamweight Championship for the third time, defeating Charlie Valencia by rear-naked choke submission at 3:09 of the first round. Faber then returned to GC July 1, 2006, and defeated Naoya Uematsu by TKO(strikes) at 3:35 of round 2 to reclaim the GC Bantamweight championship, thus holding three titles at once. Faber then took a fight in the Full Contact Promotions organization on September 9, 2006, defeating Enoch Wilson by TKO (strikes) at 1:01 of the second round. On October 28, Faber returned to KOTC and defended his title for the fourth and last time, defeating Bibiano Fernandes by TKO (cut) at 4:16 of round 1. Faber later vacated his KOTC and GC titles upon signing a contract with the WEC after it was purchased by Zuffa in December 2006. At WEC 25: McCullough vs. Cope on January 20, 2007, Faber defended his WEC Featherweight Championship for the first time since winning it ten months prior, defeating Joe Pearson by submission(strikes) at 2:31 of the first round. At WEC 26: Condit vs. Alessio on March 24, 2007, he successfully defended his title for a second time by defeating Dominick Cruz by guillotine choke submission at 1:38 of round 1, the first of only two losses of Cruz's career. At WEC 28: WrekCage on June 3, 2007, Faber defeated Chance Farrar by rear-naked choke submission at 3:19 of the first round. In his post-fight interview, Faber called out K-1 Hero's 2005 Middleweight Tournament Champion Norifumi Yamamoto, though the fight never materialized. After this match, Faber took a six-month break between fights, the longest of his career. He came back at WEC 31: Faber vs. Curran on December 12, 2007, defeating Jeff Curran by guillotine choke submission at 4:34 of the second round. Also on this card was the WEC debut of Jens Pulver, who was moving back down to Featherweight from the Lightweight division. In Pulver's WEC debut, he submitted Cub Swanson in the first round of their match setting up a title match between Pulver and Faber. Pulver and Faber both commented in their post-fight interviews that they wanted to fight each other, and the match was signed for June 1, 2008, at WEC 34: Faber vs. Pulver . Faber and Pulver fought a constant back-and-forth battle, but neither man was able to finish the other and the fight went the full five rounds, the first time in Faber's WEC career that one of his fights had gone the distance. The judges scored the bout a unanimous decision for Faber, (50–45, 50–44, and 50–44). This fight also marked both the first time that one of Pulver's fights at Featherweight had gone to decision and the first time Pulver had been defeated at that weight class. Faber was next scheduled to fight Mike Brown at WEC 36 on September 10, 2008, at the Seminole Hard Rock Hotel and Casino in Hollywood, Florida. However, this fight was postponed due to the threat of Hurricane Ike and was rescheduled for November 5, 2008, at the same location. Faber was defeated via TKO at 2:23 of the first round. On January 25, 2009, at WEC 38 Faber fought Jens Pulver in a rematch, with Faber winning by guillotine choke submission at 1:34 of the first round. Post-fight, Faber addressed WEC Featherweight Champion Mike Brown, who was seated at ringside and announced he wanted a shot at regaining his title. When Brown made his first successful title defense at WEC 39 in Corpus Christi, Texas, he responded to Faber's comments by saying that a rematch between the two of them was something "the fans want to see." Faber was defeated a second time by Mike Brown at WEC 41 on June 7, 2009, by a unanimous decision (49–46, 49–46, and 48–47) in front of his hometown crowd in Sacramento. Early in the fight, Faber broke his right hand and later dislocated his left thumb, resorting to using primarily elbows and kicks starting in the third round. Nonetheless, even in the fifth round Faber threw 15 left hooks or jabs, many of which connected. Sherdog and ESPN.com in a post-fight article noted that Faber's "right hand was no match for the top of Mike Brown's head." Immediately after the fight, Faber stated that despite the close decision, he would still like another fight against Brown. The bout with Mizugaki was rescheduled and took place on November 11, 2010, at WEC 52. Faber defeated Mizugaki via first round rear naked choke, earning Submission of the Night honors. With the victory over Mizugaki, Faber won his ninth WEC bout, a promotional record he shares with Antonio Banuelos and Poppies Martinez. Following his win at UFC 139, Faber was selected to be a coach on The Ultimate Fighter: Live opposite Dominick Cruz. Following the conclusion of the reality show, it was confirmed that Faber/Cruz III was expected to take place on July 7, 2012, at UFC 148. However, Cruz was forced to pull out of the bout citing ACL injury. It was then announced that Faber would remain on the UFC 148 fight card and face Renan Barão in a bout for the UFC Interim Bantamweight Championship, where the winner would go on to face Dominick Cruz for the UFC Undisputed Bantamweight Championship at a later date. However, due to an injury to headliner José Aldo, who was supposed to fight Erik Koch in the originally-scheduled main event, the Faber/Barão bout was moved from UFC 148 on July 7, 2012, to UFC 149 on July 21, 2012, as the event's new main event. He lost the fight by unanimous decision, suffering a broken rib during the first round. On April 13, 2013, Faber faced Scott Jorgensen at The Ultimate Fighter 17 Finale. After a fast-paced and technical fight, Faber submitted Jorgensen via rear naked choke at 3:16 in the 4th round. In the ringside interview, Faber noted, "He knows my stuff, so it was a tough fight. He made one small technical error, and I was able to capitalize on it. Props to Scotty for being a great fighter." When Dominick Cruz injured himself before his unification bout with Renan Barão, Faber was chosen as the replacement in the title fight at UFC 169. Faber lost the fight via TKO in the first round. During the fight, Barão knocked Faber down, after which he proceeded to strike him on the ground. Faber grabbed Barão's leg, and gave the referee the thumbs-up, indicating that he wanted the fight to continue. The referee did not see the thumbs-up and stepped in to end the fight, to the surprise of Faber and the spectators. In his post-fight interview, he told Joe Rogan that he believed his teammate TJ Dillashaw should get the next crack at Barão. In October 2016, Faber announced that his next fight, a bout against Brad Pickett on December 17, 2016, at UFC on Fox 22 in his home town of Sacramento would be his last. Faber went on to win the fight by unanimous decision. After the conclusion of the bout, Faber confirmed his retirement from the sport after a 13-year career. Loss 33–9 Dominick Cruz Decision (unanimous) UFC 199 June 4, 2016 5 5:00 Inglewood, California, United States For the UFC Bantamweight Championship. Loss 32–8 Frankie Edgar Decision (unanimous) UFC Fight Night: Edgar vs. Faber May 16, 2015 5 5:00 Pasay, Philippines Featherweight bout. Loss 30–7 Renan Barão TKO (punches) UFC 169 February 1, 2014 1 3:42 Newark, New Jersey, United States For the UFC Bantamweight Championship. Win 30–6 Michael McDonald Submission (guillotine choke) UFC on Fox: Johnson vs. Benavidez 2 December 14, 2013 2 3:22 Sacramento, California, United States Submission of the Night. Loss 26–6 Renan Barão Decision (unanimous) UFC 149 July 21, 2012 5 5:00 Calgary, Alberta, Canada For the interim UFC Bantamweight Championship. Win 26–5 Brian Bowles Submission (guillotine choke) UFC 139 November 19, 2011 2 1:27 San Jose, California, United States UFC Bantamweight title eliminator. Submission of the Night. Loss 25–5 Dominick Cruz Decision (unanimous) UFC 132 July 2, 2011 5 5:00 Las Vegas, Nevada, United States For the UFC Bantamweight Championship. Fight of the Night. Win 24–4 Takeya Mizugaki Technical Submission (rear-naked choke) WEC 52 November 11, 2010 1 4:50 Las Vegas, Nevada, United States Return to Bantamweight. Submission of the Night. Loss 23–4 José Aldo Decision (unanimous) WEC 48 April 24, 2010 5 5:00 Sacramento, California, United States For the WEC Featherweight Championship. Win 23–3 Raphael Assunção Submission (rear-naked choke) WEC 46 January 10, 2010 3 3:49 Sacramento, California, United States Submission of the Night. Loss 22–3 Mike Brown Decision (unanimous) WEC 41 June 7, 2009 5 5:00 Sacramento, California, United States For the WEC Featherweight Championship. Fight of the Night. Win 22–2 Jens Pulver Submission (guillotine choke) WEC 38 January 25, 2009 1 1:34 San Diego, California, United States Submission of the Night. Loss 21–2 Mike Brown TKO (punches) WEC 36 November 5, 2008 1 2:23 Hollywood, Florida, United States Lost the WEC Featherweight Championship. Win 21–1 Jens Pulver Decision (unanimous) WEC 34 June 1, 2008 5 5:00 Sacramento, California, United States Defended the WEC Featherweight Championship. Fight of the Night. Win 20–1 Jeff Curran Submission (guillotine choke) WEC 31 December 12, 2007 2 4:34 Las Vegas, Nevada, United States Defended the WEC Featherweight Championship. Fight of the Night. Win 19–1 Chance Farrar Submission (rear-naked choke) WEC 28 June 3, 2007 1 3:19 Las Vegas, Nevada, United States Defended the WEC Featherweight Championship. Win 18–1 Dominick Cruz Submission (guillotine choke) WEC 26 March 24, 2007 1 1:38 Las Vegas, Nevada, United States Defended the WEC Featherweight Championship. Submission of the Night. Win 17–1 Joe Pearson Submission (punches and elbows) WEC 25 January 20, 2007 1 2:31 Las Vegas, Nevada, United States Defended the WEC Featherweight Championship. Knockout of the Night. Win 16–1 Bibiano Fernandes TKO (doctor stoppage) KOTC: All Stars October 28, 2006 1 4:16 Reno, Nevada, United States Defended the KOTC Bantamweight Championship. Win 14–1 Naoya Uematsu TKO (punches) GC 51: Madness at the Memorial July 1, 2006 2 3:35 Sacramento, California, United States Won the GC Bantamweight Championship. Win 13–1 Charlie Valencia Submission (rear-naked choke) KOTC: Predator May 13, 2006 1 3:09 Globe, Arizona, United States Defended the KOTC Bantamweight Championship. Win 12–1 Cole Escovedo TKO (corner stoppage) WEC 19 March 17, 2006 2 5:00 Lemoore, California, United States Won the WEC Featherweight Championship. Win 11–1 Ivan Menjivar DQ (illegal kick to downed opponent) TKO 24: Eruption January 28, 2006 2 2:02 Laval, Quebec, Canada Featherweight debut. Win 9–1 Shawn Bias Submission (standing guillotine choke) KOTC: Execution Day October 29, 2005 1 1:24 Reno, Nevada, United States Defended the KOTC Bantamweight Championship. Loss 8–1 Tyson Griffin TKO (punches) GC 42: Summer Slam September 10, 2005 3 0:05 Lakeport, California, United States Lost the GC Bantamweight Championship. Win 8–0 Hiroyuki Abe TKO (doctor stoppage) KOTC: Mortal Sins May 7, 2005 3 2:37 Primm, Nevada, United States Defended the KOTC Bantamweight Championship. Win 6–0 Eben Kaneshiro Submission (punches) KOTC 44: Revenge November 14, 2004 3 4:33 San Jacinto, California, United States Won the vacant KOTC Bantamweight Championship. Brad Pickett is an English mixed martial artist currently signed to Absolute Championship Berkut. He is the former Cage Rage British Featherweight Champion. 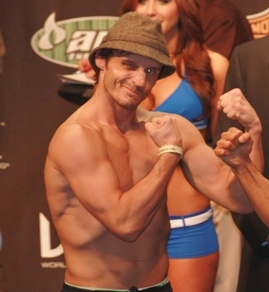 He competed as a bantamweight in the Ultimate Fighting Championship; Dana White stated that Pickett was one of his favourite fighters to watch. He has also competed for World Extreme Cagefighting and BodogFIGHT, and at the Dynamite!! USA event. Ivan Menjivar is a Salvadorian-Canadian mixed martial artist who formerly fought in the featherweight division of the Ultimate Fighting Championship. Manvel Gamburyan is an Armenian-American mixed martial artist who has competed in the UFC's lightweight, featherweight, and bantamweight divisions. A professional competitor since 1999, he was a cast member of Spike TV's The Ultimate Fighter 5, and also competed in the WEC and for King of the Cage. Eddie Wineland is an American mixed martial artist who competes in the Bantamweight division of the Ultimate Fighting Championship. A professional competitor since 2003, Wineland is a former WEC Bantamweight Champion. As of 26 July 2018, he is the #15 ranked contender in the official UFC bantamweight rankings. WEC 31: Faber vs. Curran was a mixed martial arts (MMA) event held by World Extreme Cagefighting (WEC). The event took place on Wednesday, December 12, 2007 at the Hard Rock Hotel and Casino in Las Vegas, Nevada and was aired live on the Versus Network. Brian Bowles is an American mixed martial artist who most recently competed in the Bantamweight division of the Ultimate Fighting Championship. A professional competitor since 2006, Bowles is also the former WEC Bantamweight Champion. WEC 34: Faber vs. Pulver was a mixed martial arts event held by World Extreme Cagefighting that took place on June 1, 2008 at the ARCO Arena in Sacramento, California. The main event, announced on WEC 33, was a bout between Jens Pulver and Urijah Faber for the WEC Featherweight Championship. WEC 34 was aired live on Versus. Scott Roger Jorgensen is an American mixed martial artist currently competing in the Bantamweight division. 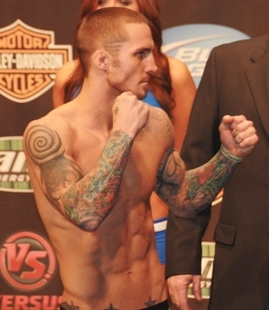 A professional competitor since 2006, Jorgensen has formerly competed for the UFC, WEC, and ShoXC. WEC 38: Varner vs. Cerrone was a mixed martial arts event held by World Extreme Cagefighting on January 25, 2009. It aired live on the Versus Network. In the main event, WEC Lightweight Champion Jamie Varner defended his title against undefeated top contender Donald Cerrone. Joseph Rolando Benavidez is an American mixed martial artist. After fighting in smaller shows while working as a screen printer in Las Cruces, New Mexico, he joined up with Urijah Faber's Team Alpha Male in 2007. He has since fought in Dream and more recently the World Extreme Cagefighting promotion. He currently fights as a flyweight in the Ultimate Fighting Championship. His fighting style has drawn comparisons to training partner and former WEC Featherweight Champion Urijah Faber.On April 27, 2010, the Mayor and City Council of the City of Las Cruces proclaimed April 27 as Joseph Benavidez Day in Las Cruces. As of December 18, 2018, he is ranked #2 in the official UFC flyweight rankings. WEC 40: Torres vs. Mizugaki was a mixed martial arts event held by World Extreme Cagefighting on April 5, 2009 at the UIC Pavilion in Chicago, Illinois. The event aired live on the Versus Network. Dominick Rojelio Cruz (born March 9, 1985 in Tucson, Arizona) is an American mixed martial artist. He fights in the Ultimate Fighting Championship (UFC) and is a two-time UFC Bantamweight Champion. Cruz was also the final bantamweight titleholder of World Extreme Cagefighting (WEC). Takeya Mizugaki is a Japanese mixed martial artist currently competing in the Bantamweight division of Absolute Championship Berkut. A professional competitor since 2005, Mizugaki has also competed for the UFC, WEC, Shooto, and Cage Force. Renan do Nascimento Mota Pegado, better known as Renan Barão, is a Brazilian professional mixed martial artist and the former UFC Bantamweight Champion. He held one of the longest unbeaten streaks in MMA history - following a loss in his professional debut, he recorded 32 straight fights without a loss over a span of 9 years. During his championship reign, he was ranked as a top 3 pound for pound fighter and regarded as one of the best mixed martial artists in the world. His nickname Barão (baron), which predates his athletic career, was given to him by his grandmother after a character in the 1986 Brazilian soap opera Sinhá Moça. WEC 50: Cruz vs. Benavidez 2 was a mixed martial arts event held by World Extreme Cagefighting that took place on August 18, 2010 at The Pearl at The Palms in Las Vegas. WEC 52: Faber vs. Mizugaki was a mixed martial arts event held by World Extreme Cagefighting on November 11, 2010 at The Pearl at The Palms in Las Vegas. Michael Robert McDonald is a retired American mixed martial artist. McDonald competed in the Bantamweight division of the UFC, where he challenged for the interim UFC Bantamweight Championship at 22 years of age. 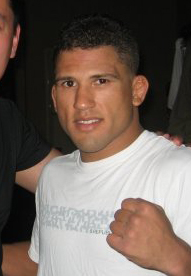 Francisco Rivera Jr. is an American mixed martial artist. He fights as a bantamweight for the Ultimate Fighting Championship. Rivera is known for his heavy hands and wild fighting style. UFC 199: Rockhold vs. Bisping 2 was a mixed martial arts event held on June 4, 2016, at The Forum in Inglewood, California. 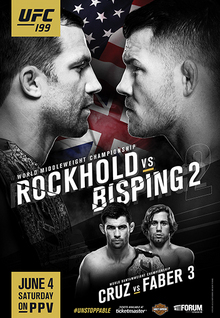 ↑ "Fight Card - UFC 181 Hendricks vs. Lawler II". UFC.com. Retrieved December 7, 2014. ↑ Guilherme Cruz (January 31, 2014). "Coach: Urijah Faber won't receive black belt in jiu-jitsu with win at UFC 169". MMAfighting.com. ↑ "Urijah Faber - Official UFC fighter Profile". UFC.com. Retrieved December 7, 2014. ↑ Dave Doyle (2012-02-07). "A pioneer for smaller fighters, Urijah Faber not ready to call it quits just yet". si.com. Retrieved 2013-02-07. ↑ Nick Caron (July 3, 2011). 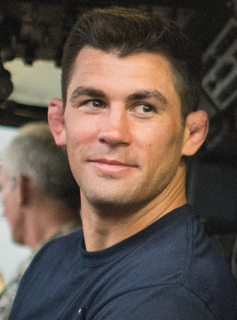 "UFC 132: Did Dominick Cruz Take a Shot at Urijah Faber with Blue Belt Promotion?". Bleacher Report. ↑ "UFC 132: Urijah Faber Embraces 'No Shirt Nation' Prior to UFC 132 Title Fight". YouTube. ↑ "Urijah Faber: Why the California Kid is Ready to Blow Up". FIGHTMAGAZINE.com. December 2007. Archived from the original on 2013-05-17. Retrieved 2010-10-08. ↑ Staff (2008-06-02). "Faber Outslugs Pulver in Five-Round Classic at WEC 34; Torres Also Retains Belt". cagepotato.com. Retrieved 2008-06-02. ↑ "Henderson Conquers Varner for Title; Faber Wins in Comeback". www.wec.tv. Retrieved 2010-01-11. ↑ "WEC 46 bonuses: Campuzano, Wheeler and Faber each earn $10K". mmajunkie.com. Archived from the original on 2012-07-11. Retrieved 2010-01-11. ↑ "WEC 48 makes jump to PPV official for April 24 in Sacramento with 'Aldo vs Faber'". mmamania.com. Retrieved 2010-02-03. ↑ "WEC 48 Faber vs Aldo Results: Champ Jose Aldo Dominates Urijah Faber". bloodyelbow.com. Retrieved 2010-04-24. ↑ "Faber MovesTo 135, Faces Mizugaki August 18". MMAWeekly.com. 2010-06-08. ↑ "Injury forces Urijah Faber out of WEC 50, Takeya Mizugaki pulled from card". mmajunkie.com. 2010-07-09. Archived from the original on 2010-07-12. Retrieved 2010-07-09. ↑ "Faber vs Mizugaki Now Targeted For The Fall". MMARising.com. Retrieved 2010-07-25. ↑ "WEC boss says Faber healed, likely meets Mizugaki at November's WEC event". MMAjunkie.com. 2010-08-20. Archived from the original on October 16, 2012. ↑ Michael David Smith (2010-11-10). "WEC 52: Urijah Faber Chokes Out Takeya Mizugaki". mmafighting.com. ↑ John Morgan (2010-11-12). "WEC 52 bonuses: Koch, Faber, Swanson and Semerzier earn $10K awards". mmajunkie.com. ↑ "UFC and WEC set to merge in 2011; events to air on Versus and Spike TV". mmajunkie.com. October 28, 2010. ↑ "Ex-WEC champs Urijah Faber and Eddie Wineland expected to meet at UFC 128". mmajunkie.com. December 29, 2010. ↑ Michael David Smith (2011-03-19). "UFC 128 Results: Urijah Faber outlasts Eddie Wineland". mmafighting.com. Retrieved 2011-03-19. ↑ "Champ Dominick Cruz vs. Urijah Faber II booked for UFC 132". mmajunkie.com. March 26, 2011. Archived from the original on May 20, 2011. Retrieved March 26, 2011. ↑ Staff (2011-07-03). "UFC 132 results: Dominick Cruz retains Bantamweight title in five round thriller". mmajunkie.com. Retrieved 2011-07-03. ↑ "UFC 132 bonuses: Condit, Ortiz, Cruz and Faber get $75,000 awards". mmajunkie.com. 2011-07-03. ↑ "Brian Bowles draws Urijah Faber at November's UFC 139 event". mmajunkie.com. 2011-07-22. Archived from the original on 2012-07-12. Retrieved 2011-07-22. ↑ "Winner of Faber vs. Bowles Gets UFC Title Shot and Possibly a Chance at Redemption". MMAWeekly.com. July 23, 2011. ↑ Staff (2011-11-19). "UFC 139 results: Urijah Faber blasts, chokes out Brian Bowles to earn title shot". mmajunkie.com. Retrieved 2011-11-19. ↑ "UFC 139 bonus awards". mmajunkie.com. 2011-11-20. ↑ "'The Ultimate Fighter 15' coaches revealed: Dominick Cruz and Urijah Faber". mmajunkie.com. December 7, 2011. ↑ "Champ Dominick Cruz vs. Urijah Faber III targeted for UFC 148 in Las Vegas". mmajunkie.com. February 10, 2012. Archived from the original on February 13, 2012. Retrieved February 10, 2012. ↑ Martin, Damon (May 7, 2012). "Dominick Cruz Injured, Out of UFC 148". mmaweekly.com. Retrieved May 7, 2012. ↑ "Renan Barao to fight Urijah Faber at UFC 148 for interim bantamweight title". mmajunkie.com. May 18, 2012. Archived from the original on July 10, 2012. Retrieved May 18, 2012. ↑ Mrosko, Gene (June 9, 2012). "Jose Aldo injured, Urijah Faber vs Renan Barao fight moved to UFC 149 main event". mmamania.com. Retrieved June 9, 2012. ↑ Martin, Damon (December 3, 2012). "Urijah Faber Expected to Rematch Ivan Menjivar at UFC 157 in Anaheim". mmaweekly.com. Retrieved December 3, 2012. ↑ Matt Erickson (2013-02-23). "UFC 157 results/photos: Urijah Faber stops Ivan Menjivar with standing choke". mmajunkie.com. Retrieved 2013-02-23. ↑ Staff (2013-02-27). "Urijah Faber-Scott Jorgensen is The Ultimate Fighter 17 Finale's new headliner". MMA Junkie. Retrieved 2013-02-27. ↑ Mike Chiapetta (2013-04-14). "TUF 17 results: Urijah Faber chokes out Scott Jorgensen". mmafighting.com. Retrieved 2013-04-14. ↑ Staff (2013-06-04). "Urijah Faber vs. Yuri Alcantara booked for UFC on FOX Sports 1 1 in Boston". mmajunkie.com. Retrieved 2013-06-04. ↑ Ben Fowlkes (2013-08-18). "UFC Fight Night 26 results and photos: Urijah Faber shuts down Yuri Alcantara". mmajunkie.com. Retrieved 2013-08-18. ↑ Damon Martin (2013-09-11). "Urijah Faber vs. Michael McDonald Set as Co-Main Event for UFC on Fox 9". bleacherreport.com. Retrieved 2013-09-11. ↑ Ben Fowlkes (2013-12-14). "UFC on FOX 9 results, photos: Urijah Faber drills Michael McDonald, then submits him". mmajunkie.com. ↑ "UFC on Fox 9 bonuses: Johnson, Faber, Barboza and Castillo win $50,000". mmajunkie.com. 2013-12-14. ↑ Matt Erickson (2014-01-06). "Dominick Cruz out, vacates title; Urijah Faber now meets Renan Barao at UFC 169". mmajunkie.com. Retrieved 2014-01-06. ↑ Hunter Homistek. "Barao vs. Faber 2: Why You Shouldn't Be OK with Herb Dean's Early Stoppage". Bleacher Report. ↑ Fox Sports. "Referee: Timing of Barao-Faber stoppage by Herb Dean was 'really weird'". FOX Sports. ↑ Brett Okamoto (2014-05-14). "Urijah Faber-Alex Caceres set". ESPN. Retrieved 2014-05-14. ↑ Ryan Yamamoto (2014-07-05). "Urijah Faber dominates at UFC 175, wins by rear naked choke". news10.net. Archived from the original on 2014-07-12. Retrieved 2014-07-05. ↑ Staff (2014-07-27). "Urijah Faber-Masanori Kanehara Added to UFC Fight Night 'Hunt vs. Nelson' Main Card". sherdog.com. Retrieved 2014-07-27. ↑ Staff (2014-08-08). "Alex Caceres replaces Urijah Faber, meets Masanori Kanehara at UFC Fight Night 52". mmajunkie.com. Retrieved 2014-08-08. ↑ Staff (2014-10-15). "Urijah Faber meets Francisco Rivera at UFC 181 in Las Vegas". mmajunkie.com. Retrieved 2014-10-15. ↑ Tristen Critchfield (2014-12-07). "Urijah Faber wasn't initially aware eye poke led to victory over Rivera at UFC 181". sherdog.com. Retrieved 2014-12-07. ↑ Marc Raimondi (2014-12-07). "Francisco Rivera will appeal submission loss to Urijah Faber due to eye poke". sherdog.com. Retrieved 2014-12-07. ↑ Brent Brookhouse (2015-02-17). "NSAC upholds UFC 181's Urijah Faber vs. Francisco Rivera result despite eye-poke". mmajunkie.com. Retrieved 2015-02-17. ↑ Staff (2015-01-21). "Urijah Faber vs. Raphael Assuncao headlines UFC Fight Night 62 in Brazil". mmajunkie.com. Retrieved 2015-01-21. ↑ Guilherme Cruz (2015-02-02). "Raphael Assuncao injured, out of UFC Fight Night 62 main event with Urijah Faber". mmafighting.com. Retrieved 2015-02-02. ↑ Steven Marrocco (2015-02-03). "Out of UFC headliner, Assuncao still targets champ Dillashaw: 'He knows I'm coming'". mmajunkie.com. Retrieved 2015-02-03. ↑ Guilherme Cruz (2015-02-04). "Demian Maia vs. Ryan LaFlare set to headline UFC Fight Night 62 in Brazil". mmafighting.com. Retrieved 2015-02-04. ↑ LeeLi (2015-02-11). "UFC Manila gets a Superfight: Frankie Edgar vs Urijah Faber set for the 1st Philippines card". mma-in-asia.com. Retrieved 2015-02-11. ↑ Anton Tabuena (2015-02-11). "Urijah Faber vs. Frankie Edgar set as UFC: Manila headliner". bloodyelbow.com. Retrieved 2015-02-11. ↑ Mike Bohn and MAjunkie Staff (2015-02-11). "Urijah Faber returns to 145, meets Frankie Edgar at UFC Fight Night 66 in Philippines". mmajunkie.com. ↑ Dave Doyle (2015-05-16). "UFC Fight Night 66 results: Frankie Edgar defeats Urijah Faber for fourth straight win". mmafighting.com. Retrieved 2015-05-16. ↑ Tristen Critchfield (2015-09-03). "Bantamweights Urijah Faber, Frankie Saenz to meet at UFC 194 on Dec. 12". sherdog.com. Retrieved 2015-09-03. ↑ Brent Brookhouse (2015-12-12). "UFC 194 results: Urijah Faber takes hard-fought decision over game Frankie Saenz". mmajunkie.com. Retrieved 2015-12-12. ↑ Staff (2016-03-04). "Rockhold-Weidman 2, Cruz-Faber 3 headline UFC 199 on June 4 at The Forum in L.A." mmajunkie.com. Retrieved 2016-03-04. ↑ Elias Cepeda (2016-06-05). "Dominick Cruz breaks tie with Urijah Faber, defends UFC title". foxsports.com. Retrieved 2016-06-05. ↑ Damon Martin (2016-07-12). "Urijah Faber meets Jimmie Rivera at UFC 203 in Cleveland". foxsports.com. Retrieved 2016-07-12. ↑ Damon Martin (2016-09-10). "Jimmie Rivera earns biggest career win with decision over Urijah Faber". foxsports.com. Retrieved 2015-09-10. ↑ Jesse Holland (2016-10-18). "Urijah Faber vs. Brad Pickett set for UFC on Fox 22 in Sacramento". mmamania.com. Retrieved 2016-10-18. ↑ Shaun Al-Shatti (2016-10-24). "Urijah Faber announces he will retire after UFC on FOX 22 fight". mmafighting.com. Retrieved 2016-10-25. ↑ "Urijah Faber retires with a dominant victory over Brad Pickett". FOX Sports. 2016-12-17. Retrieved 2016-12-18. ↑ "Urijah Faber May Build Team Alpha Fail: Vegas for TUF 15". mmaweekly.com. Retrieved January 11, 2012. ↑ "Duane Ludwig MMA Coach of the Year". Archived from the original on 2016-01-09. Retrieved 2014-01-01. ↑ Staff (2014-09-26). "Faber confirms Kampmann as full-time Team Alpha Male coach". mmajunkie.com. ↑ "MMA's week out of the cage: Daniel Cormier turns 40, 'Cowboy' Cerrone's swimming lessons". mmajunkie.com. March 24, 2019. ↑ "UFC 132 bonuses: Condit, Ortiz, Cruz and Faber pocket $75,000". sherdog.com. 2011-07-02. ↑ "UFC 139 bonuses: Hendo, Rua, Wand, Le, Faber, McDonald nab $70K". sherdog.com. 2011-11-19. ↑ "UFC on Fox 9 bonuses: Johnsn, Faber, Barboza, Castillo each earn $50K". sherdog.com. 2013-12-14. ↑ Chuck Grace. "MMAInsider's 2013 Annual Awards: The Results". MMAInsider.net. ↑ John Joe O'Regan. "Browne, White, Gustafsson, Rousey winners at World MMA Awards VI - Fighters Only". Archived from the original on 2016-01-09. Retrieved 2017-05-28. 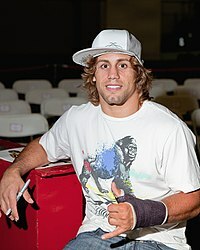 Wikimedia Commons has media related to Urijah Faber .